What sort of adaptations were providers making? Did the adaptations that different providers were making resemble one another? How systematic was the process of adaptation? How were practice quality and fidelity being ensured for the adapted practice? The webinar and report answer most of these questions. We did find that the adaptations being made across providers and programs strongly resembled each other, which made sense since the adaptations responded to developmental differences between young adults/older youth and younger children in Wraparound. We also found that while practice was adapted significantly, providers were mostly confident that the adapted practice nonetheless adhered to Wraparound principles and fidelity guidelines. 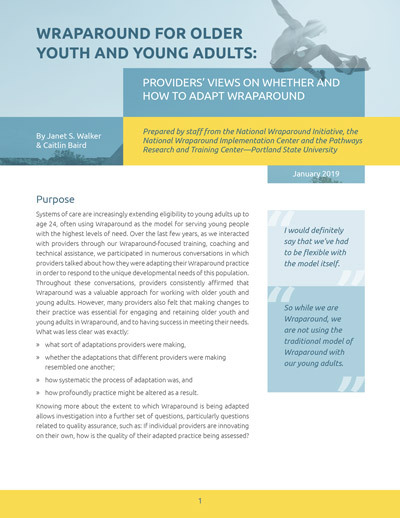 However, providers were not so confident about some areas of practice, and wanted clarification, particularly regarding expectations for teams (e.g., membership and frequency of meeting) and timing (e.g., how the phases of Wraparound might look different for youth and young adults). Further, providers were looking for guidance around how to ensure fidelity when practice is adapted. If you are interested in this topic, I encourage you to read the report and/or view the webinar. Staff at the NWI and NWIC have made plans to follow up on some of the issues described above. We plan to mobilize our experts and develop a learning community to aid us in creating specific guidance around fidelity expectations. This should happen in the Spring of 2019, with a guidance document coming out after that. We will be providing further training and technical assistance during the National Wraparound Implementation Academy in September, and hope to see you there. Rooms at the Academy hotel are going fast!